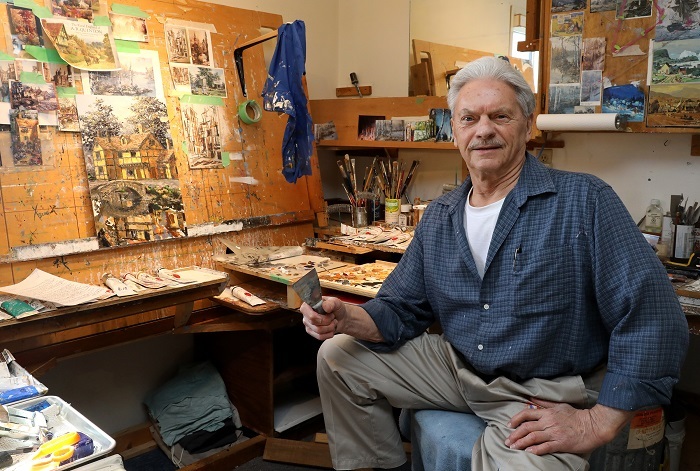 James Keirstead is one of Canada's foremost landscape and heritage artists. Painting with knives and oils, he has a distinctive, boldly textured, impressionistic style. His nostalgic heritage subjects and peaceful landscapes bring quiet enjoyment that have universal appeal. The angular Keirstead signature conjures up romantic images. For more current information please view the Interview with James Keirstead by Tae Hyeong Kim. The family grew up in Ontario, residing in Toronto and Whitby, finally moving in 1949 to Sharbot Lake. A few months later at age seventeen, when their house burned, Jim joined the Canadian Armed Forces, serving in Korea during the war from 1952-53. From 1954 to 1965 he served as a Constable with the Ontario Provincial Police, stationed in Kingston. It was during his police years that he started taking art courses, haunting art galleries and libraries, taking advantage of every opportunity to paint. In 1965 he took the plunge into the precarious world of art. Private art galleries were opening up across the country. He painted and took his work to galleries and exhibitions in Ottawa, Toronto, and Niagara, then back to his studio to paint. As demand for his work was steadily increasing. His first paintings were of Ontario-the landscapes, homesteads, barns, and the old mills-all subjects that have become synonymous with the angular signature. Then he began to travel as much as possible, heading east to Quebec, and on to the coves of Nova Scotia and Newfoundland. Later, he painted Western Canada –the mountain grandeur of British Columbia and Alberta, and the rugged coast of Vancouver Island. His success was achieved through a little luck and timing, and a lot of hard work, perseverance and dedication. Looking back fondly on the early years, Jim describes that time simply—“It was such a great adventure”. In more recent years, Jim and his wife, Robere, traveled and painted in Europe. The cottages and gardens of England’s Cotswold region are favourite subjects along with Venice and Paris . The old water powered mills, stone homesteads of Eastern Canada and the U.S.A. have continued to be favoured by Keirstead collectors. 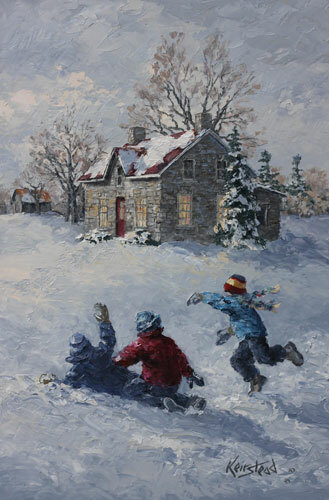 Other subjects include old mills, and homesteads and across eastern Canada and the U.S.A.
Keirstead’s artwork includes scenes of children, dogs and young people including a hockey series. Recently he is painting modern stylized impressionistic street scenes some call semi-abstract. These are of Paris, Brussels and Venice, Toronto, Montreal and Quebec some of his favourite places. His art has been exhibited in nearly 140 one man shows in Toronto, Ottawa, Kingston, Niagara-on-the-Lake and New York city to mention a few. Currently Keirstead is exhibiting at Gallery on the Lake in Buckhorn,Ontaio, at his own studio/gallery and with Crescent Hill Gallery in Mississauga, Ontario . Keirstead paintings hang in over 1000 private collections and many corporate collections. 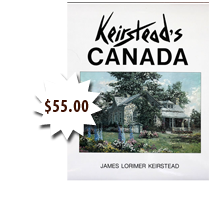 Some of his paintings are available in print form, and in his latest book Keirstead’s Canada. All the 23 editions of Keirstead Collector Plates are sold out. Jim has received many awards and commendations during his long career. However, he feels that the highest honours are received from collectors who continue building their private art collections with his work. The Keirsteads’ favourite event is the annual Spring Exhibition. “This is when my new originals are offered for sale. With the help of friends, Robere and I open our riverside home and property to visitors. Robere’s spectacular flower gardens and my miniature stone mill are popular attractions.
" For me, painting is a lifelong adventure. I hope my art inspires an appreciation for my favourite places--heritage scenes from Canada and the World"